Set the mood for a glamorous season with a sassy citrus sparkle! Our new Wishes & Dreams Fragrance features a femininity and romanticism embodied in the heart of fresh florals, sensual woods and white amber. Bottle design is inspired by the infinity symbol and eternal beauty. Wishes & Dreams was developed by perfumer Patricia Choux; notes include bergamot, freesia, pear, jasmine, violet, osmanthus, musk, woods and patchouli. 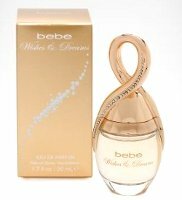 Bebe Wishes & Dreams is available in 50 ml Eau de Parfum and in a 10 ml Rollerball. This bottle reminds me of the original parfum/EDP bottles for Elizabeth Taylor White Diamonds. Yes, it’s definitely a riff on that theme. Guessing the target market won’t remember that bottle though! I think bebe skews pretty young. Ha! I knew it reminded me of something I’d seen in the perfume world before. I just couldn’t put my finger on it. My first thought was that it looks like a riff on the J’Adore bottle (which the Bebe demographic would likely be familiar with) — though I definitely see the White Diamonds resemblance, too. The Notes Sound Awfully Nice and that Bottle is Quite Pretty! Might be worth a lurk into Bebe to give a sniff! Ha, you guys are right, it’s a mutt.